'Pain is bad, right? In this fascinating book, Brock Bastian will convince you otherwise. Drawing on both vivid everyday examples and surprising laboratory findings, he shows how pain, suffering, and struggle give us pleasure, make us kinder, focus our thoughts, and give our life meaning. Bastian is a brilliant researcher and deep thinker and THE OTHER SIDE OF HAPPINESS is a delight to read' Paul Bloom, author of AGAINST EMPATHY'Brock Bastian skilfully shatters the zeitgeist of positive thinking, showing how struggle and suffering are vital elements of a life well lived'Adam Grant, author of ORIGINALS and OBTION B with Sheryl Sandberg'If you're tired of all the simple minded books telling you to just cheer up and be happy, this is the book for you!' Roy F.
Baumeister, author of WILLPOWER: REDISCOVERING THEGREATEST HUMAN STRENGTH 'Explains why hardship sometimes yields richer lives that are laden with meaning, deep social connections, and unexpected bliss. A beautifully written and important book that should be required reading for anyone who's ever wondered why well-being so oftenflourishes in unexpected places' Adam Alter, author of DRUNK TANK PINK In today's culture, happiness has become the new marker of success, while hardships are viewed as personal weaknesses, or problems to be fixed. We increasingly try to eradicate pain through medication and by insulating ourselves from risk and offence, despite being the safest generation to have ever lived. Yet in his research, renowned social psychologist Brock Bastian has found that suffering and sadness are neither antithetical to happiness nor incidental to it: they are a necessary ingredient for emotional well-being. Drawing on psychology, neuroscience and internationally acclaimed findings from Bastian's own lab, The Other Side of Happiness encourages us to take a more fearless approach to living. The most thrilling moments of our lives are often balanced on a knife edge between pleasure and pain, whether it is finding your true love, holding your new-born for the first time, finishing a marathon or even plunging into an icy sea. 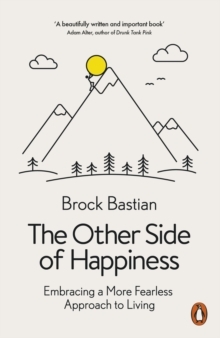 This is because pain and the threat of loss quite literally increase our capacity for happiness, as Bastian reveals, making us stronger, more resilient, more connected to other people and more attuned to what truly matters. Pain even makes us more mindful, since in our darkest moments we are especially focused and aware of the world around us. Our addiction to positivity and the pursuit of pleasure is actually making us miserable. 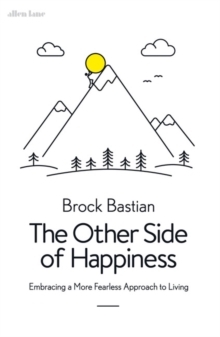 Brock Bastian shows that, without some pain, we have no real way to achieve and appreciate the kind of happiness that is true and transcendent.